In luxury items there is fierce competition these days, and then there are those items that defy competition due to their superiority. 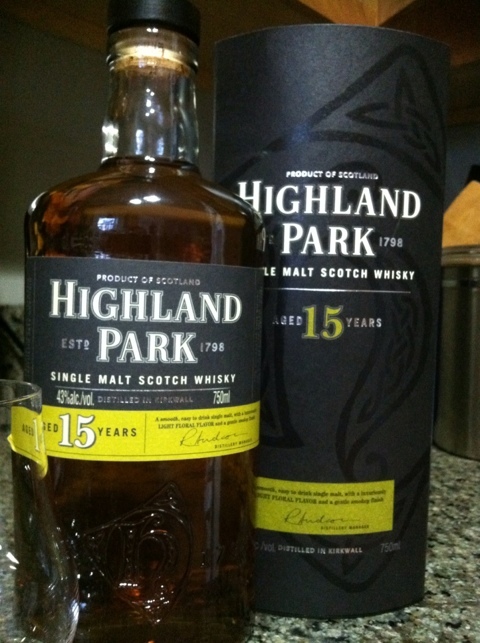 Highland Park whisky is one of those products. In fact the 18 year was bestowed “best scotch in the world” by one reviewer. There is a virtual sea of scotch whisky products these days and much of it really good. Highland Park has always been a standard since I’ve been into serious whisky but for some reason I’ve evaded buying my own bottles. Today I corrected that mistake. The ABC store had the 12 and 15 year on sale. I grabbed the 15 year for around $67. When I last tasted the HP products it was with Martin Daraz on a whisky cruise in Washington D.C. It’s amazing how different the mouthfeel is on these two. The 12 year is all over your tongue like a young spirit without rest. The 15 year actually shows a completely different and mature behavior and lays down the softest, lightly peated fruit. You might even be mistaken to call this an Islay scotch. The mouth feel is one I like, it has a viscous, oily finish that I find goes really well with a cigar. Some say that this (Highland Park) is just too much to pay for whisky but if you enjoy premium products you owe it to yourself to try Highland Park, even the 12 year is very nice. I’m going to enjoy this bottle over the holidays this year. I hope you find a spirit you enjoy also.